Quiko Egg Foods are made with real whole eggs and pure honey without the use of oils, which may cause rancidity. Quiko products are simply the best quality available. 1. Sprinkle 2 Tbs. 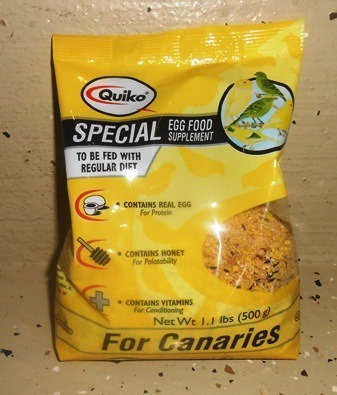 of dry Quiko Special over your bird's daily diet. 2. Moisten 2 Tbs. of Quiko Special with enough water or juice to make a moist crumble texture, feed in a separate treat cup. 3. Mix 2 Tbs. of Quiko Special with 1 Tbs soaked seed and feed in a separate treat cup. For variety try combining chopped fruit (kiwi, grapes, bananas, papaya) or chopped greens (kale, endive, romaine lettuce) or sprouts and seeds to the egg food. For convenience, a larger batch can be mixed and refrigerated for up to 1 week. Remove and discard any uneaten food daily.